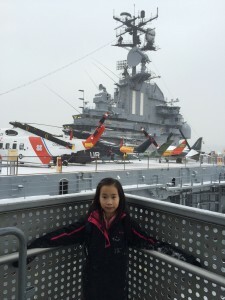 On President’s Day, I went to the USS Intrepid Museum. 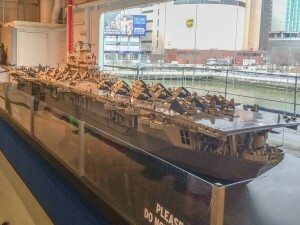 The USS Intrepid is an aircraft carrier that took part in many battles, including World War ΙΙ. 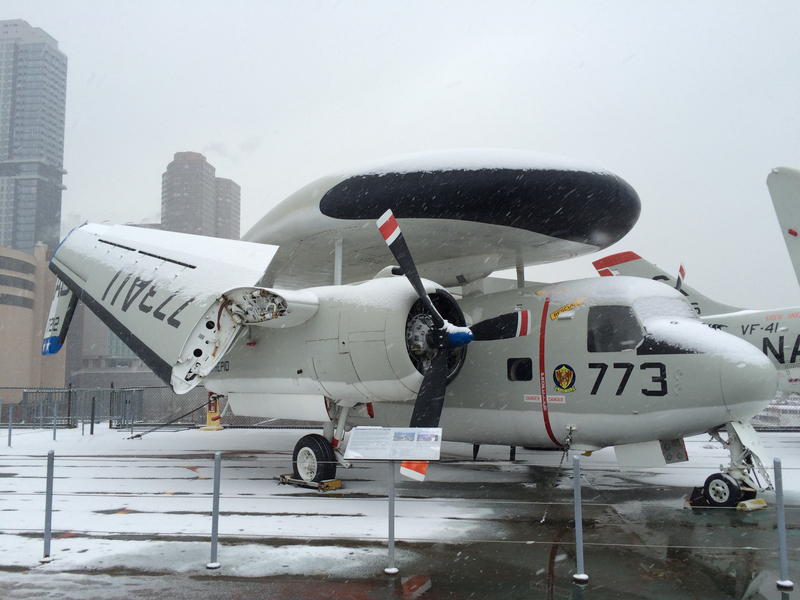 Now, the USS Intrepid has been turned into the Intrepid Sea, Air, and Space Museum in New York! I thought the ship would be stuffy, stinky, and unstable. But when I entered, it looked like a spacious museum, just like the ones on land! 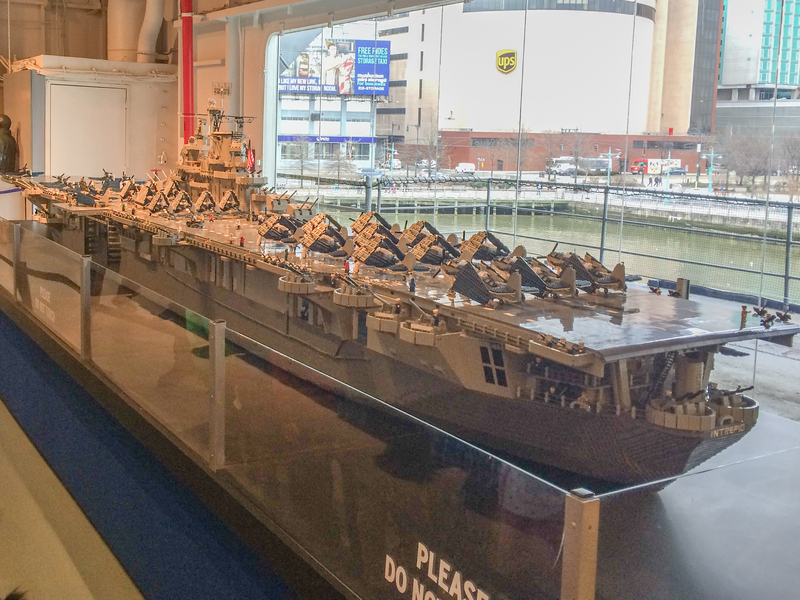 (If you turned the ship vertical, it would almost be the same height as the Empire State Building!) The air was fresh! There were different planes on display that had actually fought in battles! We went to a stage, and sat down for a fascinating talk by Dr. Aaron Parness about sending robots into space to explore asteroids. Dr. Parness said that his team designed robotic hands that had many motors to grip rough surfaces. The reason that the robots need special hands, is because on asteroids, gravity is really small. 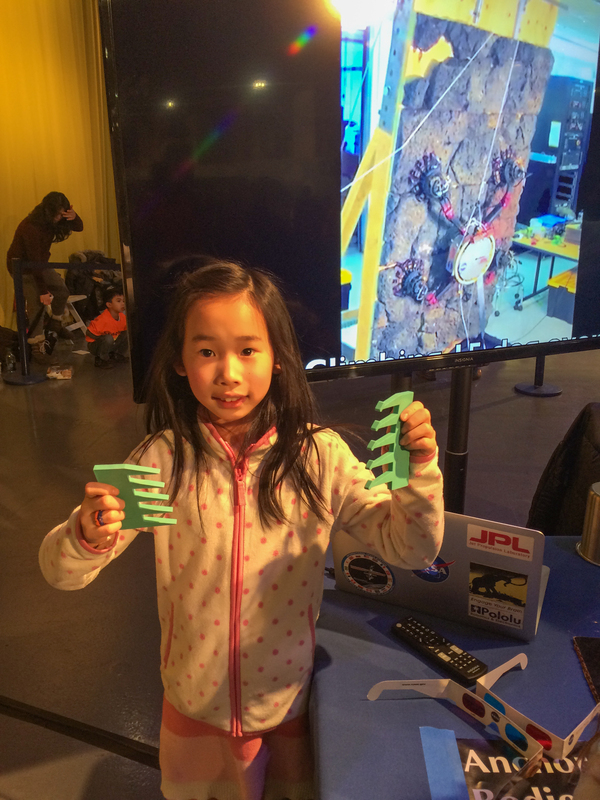 So, if the robot does not have special hands to grip on the surface of the asteroid, the robot would float away. But, what if the surface is smooth? Dr. Parness said that he observed the gecko lizard, since the gecko lizard has very special hands that “stick” so the lizard can climb up smooth surfaces. The reason that the lizard can unstick itself is because there are tiny little hairs on its hands that when pushed one way, the hands are sticky. When the hairs are pushed the other way, they unstick! It is made possible by friction. So, Dr. Parness found a material that mimicked the lizard’s sticky hands. This way, the robot could walk on smooth surfaces like glass. Dr. Parness even showed us a video of one of his test runs. It was a video of a robot climbing a rock surface. The robot could support itself even while hanging from one arm! The scientists that thought of this idea and the scientists who designed this amazing robot are geniuses! The other exciting talk was by Dean Eppler, who worked for NASA testing space suits. Mr. Eppler said that his job was really tiring. That’s because his space suit weighed about 200 pounds in total! His air tank weighed 100 pounds by itself! But in space, there is little gravity, so it would not be so heavy there. Mr. Eppler used to be a geologist. NASA made him collect rocks wearing his space suit, since collecting rock samples is one of the things that astronauts do in space. He was sent to places like New Mexico and Arizona, because terrains in those places are similar to the terrain on Mars. 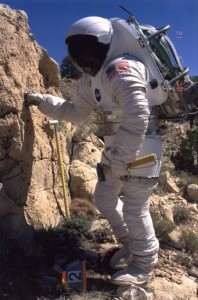 Mr. Eppler even tried wearing a space suit while driving a rover. It would be devastating if there was no space suit tester! 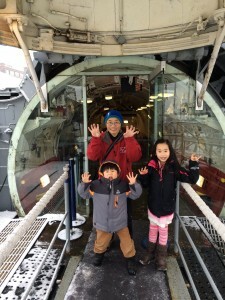 Then we went on a submarine called Growler. Even the entrance was not ordinary. There was a “wall” that had a hole through it. 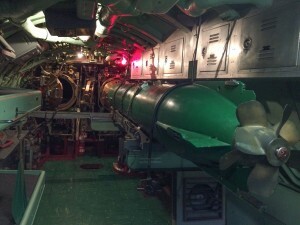 A sign next to it said: You must be able to climb through this hole to access the submarine. That got me excited! When we entered the submarine, I saw that there was not the same amount of space in here as in your living room. We descended a flight of stairs. I saw a long corridor so narrow that only one person could fit in it. 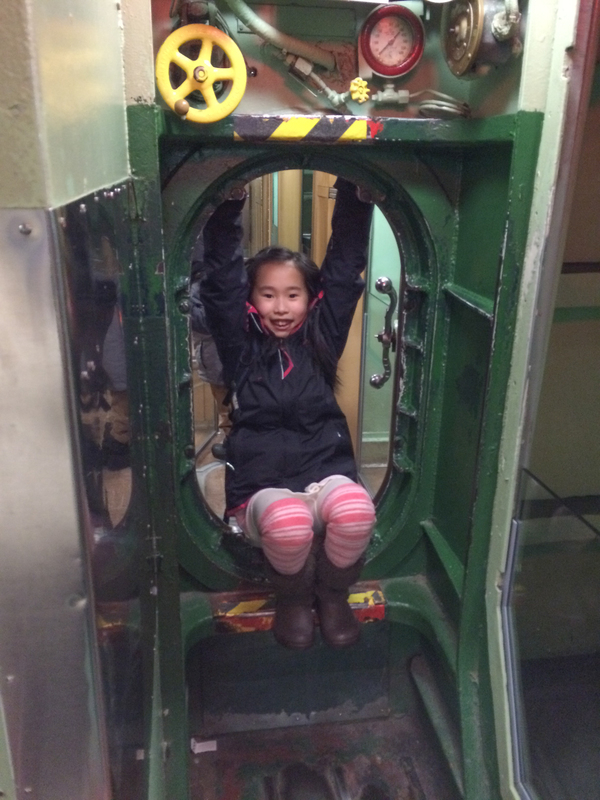 On either side of me as I walked through the corridor, I saw things from control panels to bunk beds that were so small that you could not sit up in them. I was so surprised that anybody could sleep in such a tight space! Later on the walk, we passed by the entertainment rooms. No, there was no TV, there was no Xbox, there was not even an electronic device in sight! The only form of entertainment that I could see were some black and red game boards printed on to the tables. The game boards were chess, backgammon, and checkers. Wow! The sailors on this submarine must have been really bored when they were under water! On the submarine, there were holes to go through instead of doors. On space ships they also use this sort of “door” to go from one room to another. At the end of the walk, I saw a torpedo. A funny thing was that there were two beds next to a torpedo. I was scared that the people who used to sleep next to the missile might be blown up if they roll out of their bed in the middle of the night, and trigger the torpedo. And then, BOOM! I feel it was very different from the submarine in “20,000 Leagues Under the Sea”. In that story, there was a luxury submarine that people were happy to live in. 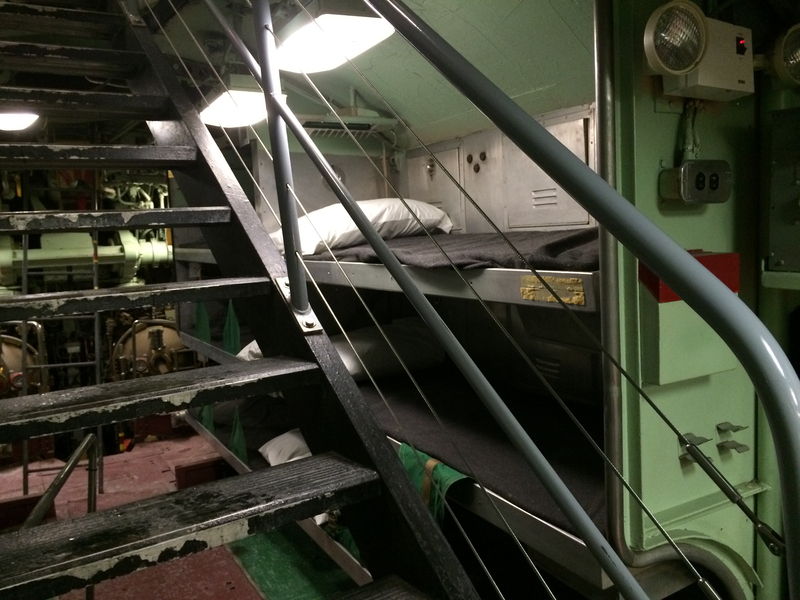 I do not know if the sailors liked living in a submarine with beds so small that if you rolled around you might fall off. Probably not. Just the same, Growler is pretty cool. 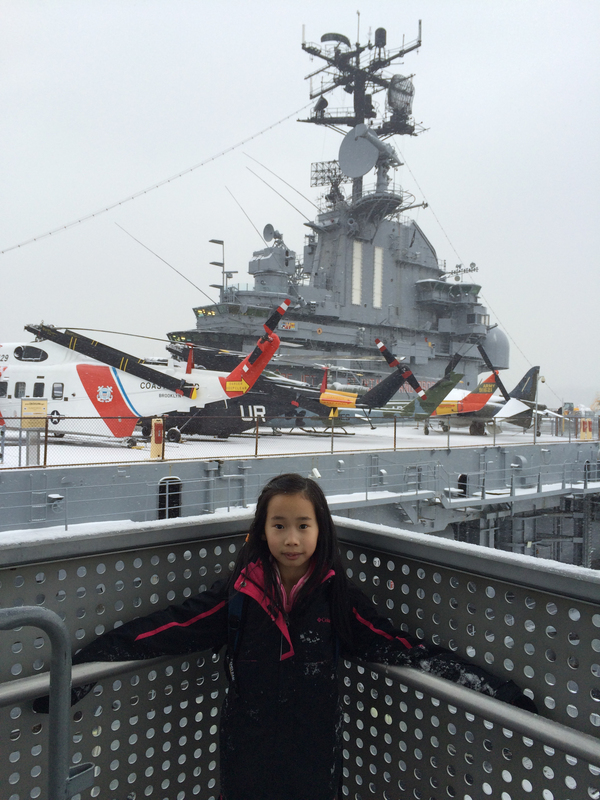 Last but not least, we went on the flight deck of the USS Intrepid. The deck was used for airplanes to take off. It was snowing, the planes looked like sugar was sprinkled on top of them. Even though the USS Intrepid was about as long as the Empire State Building, planes take a longer runway to takeoff. The way that they launch planes on the USS Intrepid is like holding the planes back with a rubber band, and suddenly releasing it. I quickly picked out my favorite plane which was a pointy nosed sharp looking plane. It was so amazing to be next to a plane that had probably taken part in a real battle!